There is something for everyone at the Monastery of the Holy Spirit, and we invite you to “come and see” all that we have to offer. 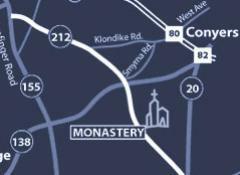 Stop by for the day or participate in a retreat, and immerse yourself in the monastic culture. A visit to the Monastery appeals to the mind, body and soul. While the natural beauty of the land and the unique architecture appeals to the eye, the monk’s commitment and dedication speaks to the soul. Take a “mini retreat” and join us for the day. Enjoy nature, learn about the ancient traditions of Monasticism, explore our bonsai gardens, see the Gothic architecture and shop at the Abbey Store, it’s worth the trip! Find out how you can see it all. The Monastery welcomes groups of all sizes and can help you plan a meaningful experience for a day or for an overnight trip. Senior and student field trips, business retreats, and tour groups visiting Atlanta are a few of the many types of groups who enjoy visiting the Monastery every year. Learn more about how to plan a great trip. Have you ever just wanted to get away from it all? If so, the Monastery is the perfect place for you to escape to. Surround yourself in the Monastery’s natural beauty where you can rest, reflect, relax and learn about the monastic life. You are welcome to join us whenever you’d like. The Visitor Center features interactive displays, exhibits and videos about the monastic tradition, as well as the Trappist monks at the Monastery of the Holy Spirit. Take a glimpse into the purpose, inspiration and daily life of the monks by touring our Visitor Center and its amenities. Visit "Georgia's Most Remarkable Concrete Building“ as described in “The History of Engineering in Georgia.” Learn the Inspiring story of it’s builders and see the unusual beauty that they created. Arabia Mountain National Heritage Area is an expansive green space designated by Congress based on natural, cultural and historic resources. Thanks to a large group of dedicated individuals, the Monastery is proud to be a part of this sprawling green space and nationally important site. The monthly Highlights & Insights Tour at the Monastery of the Holy Spirit is offered on scheduled Saturdays. Ready to visit the Monastery of the Holy Spirit? We're located just 35 minutes outside of Metro Atlanta in scenic Conyers, Georgia. Prayer services are held 7 times throughout the day beginning with Vigils at 4 a.m. and ending with Compline at 7:30 p.m. Click below for the Monastery’s detailed prayer schedule.